The wine industry of the country is one of the most important sectors of rural economy, because it constitutes an essential growth factor. It’s an employment creator, it brings income for the country , it adds value and contributes to combating rural depopulation. 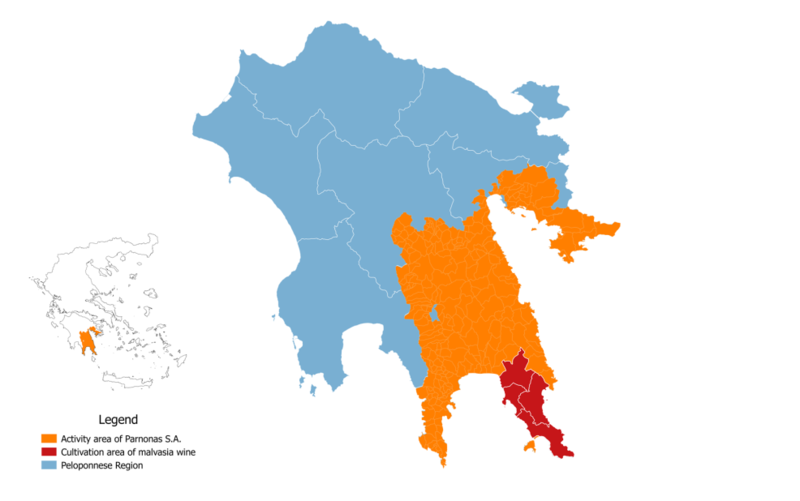 The region of Peloponnese is one of the nine in the country, which has the largest vineyard of wine grapes with a percentage of 29.5% of the total, approaching 237,000 acres. Moreover, it owns primacy in all productive sectors namely in the number of wineries, the number of generated labels and the number of bottles. One of the most famous wines produced in the Peloponnese is Malvasia wine. It is dark sweet white wine from raisined grapes. It was the most famous wine in Europe in the years of the trade republic of Venice and it was produced mainly in Crete and the Cycladic islands with the most important production center of Paros, where it was transported by ships in ports and from there to the “salons” of Europe. Nevertheless, its history categorically testifies it name starts from Monemvasia. From 2011 until now, the Greek wine legislation has allowed the myth of Malvasia wine to revive. From the three Designations of Origin that were established then, the first known as “protected designation of origin” (PDO) Monemvassia-Malvasia and the first modern Malvasia wine from Monemvasia is already a fact. The production area of PDO Monemvasia – Malvasia (Monemvasia – Malvasia) extends in the agrarian region of the former municipalities of Monemvasia, Asopos, Vies and Molaoi of Laconia. The PDO Monemvasia- Malvazia white wines, are produced from grapes of the Monemvasia variety at least of 51% and a floating rate of the varieties of Assyrtiko, Kydonitsa and Asproudes. The Development Company of Parnon S.A. through the new Programming Period CLLD/LEADER 2014-2020 aimed to transnational cooperation with countries implementing LEADER local programs. The aim of this cooperation is the emergence and spread of wine culture, as well as the interconnection of the tourist identity of the regions with their traditional products that have quality, reputation and are directly linked to the region for the development of gastronomic tourism. Research and documentation: Research and development of bibliographic, historical, research data. Scientific substantiation of the value and the brand name Malvasia in historical time, from the start of its production until the expansion and consolidation in Europe and the new productive areas in the Mediterranean. Creation of transnational brand Malvasia: Concept, story and development of the brand. Creation of individual elements (graphics, videos, texts, etc.) The way of brand acceptance and inclusion in products and campaigns of relevant enterprises. Electronic promotion: Design of Multilanguage Website by presenting elements of history and wine production, wine and other complementary businesses, wine and related products, tourist information production areas etc. Design and implementation of web promotion campaign, pages on social media. Designing mobile applications mobile apps or mobile sites. Education: Design of educational seminars for entrepreneurs in production areas, to develop related Malvasia products and services. Exchange of visits: Plan visits of producers and other interested in producing areas in the Mediterranean. Combination with related activities, such as conferences, festivals and events on Malvasia, and exchange of experiences for learner’s entrepreneurs etc. Events: Design and implementation of new events or strengthen and upgrade existing networking events and wine festivals and historical interest on Malvasia in the regions involved. Creation and support of wine tourism activities. Design and creation of tourist packages. The budget of the project will be determined according to the number of the regions concerned and partners, which cannot be less than three, as is not considered representative for Malvasia wine production areas. The transnational cooperation proposal, is currently at an early phase and may change depending on the requirements and participation of new partners, that will determine the total project budget and budget per partner.